The story of arthritis is an interesting one. There are over 200 diseases that fall under the name arthritis, though most arthritic conditions fall into one of two categories: rheumatoid arthritis and osteoarthritis. Let’s take a look at rheumatoid arthritis vs. osteoarthritis, or RA vs. OA. These are different types of arthritis that share similar characteristics. For instance, each arthritis type has similar symptoms like a limited range of motion and intense pain, especially in the morning. Rheumatoid arthritis and osteoarthritis also affect the joints, causing pain, stiffness, inflammation, and tenderness. That said, the key difference between rheumatoid arthritis and osteoarthritis is the cause behind how the joints are affected. Osteoarthritis is a slow and progressive degenerative joint disease, that is, it will slowly develop over years of wear-and-tear on the joints and cartilage. On the other hand, rheumatoid arthritis is an autoimmune, inflammatory, and systemic disease in which your immune system wrongly attacks the lining of your joints. 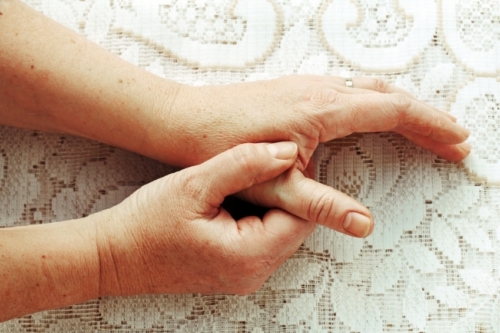 Rheumatoid arthritis may develop gradually, but it can also appear quite suddenly. It’s also important to note that each condition has different symptoms which need different treatments. Your doctor will help you reduce pain, swelling, and joint damage in both osteoarthritis and rheumatoid arthritis. Let’s get a better understanding of these diseases with an overview each arthritis type. First off, what is rheumatoid arthritis? This autoimmune disease affects the entire body, not just the joints. Although this chronic condition only affects two to three percent of the population, it can be quite a difficult disease to predict. Basically, the disease may disappear after a few months, or it may become worse. Rheumatoid arthritis will often begin between ages of 20 to 40 years old, but it may start at any age, including children. The cause of rheumatoid arthritis is often debated, however, the factors thought to play a role in the disease include: food allergies; genetic factors; emotional stress; viral, bacterial, or fungal infections; accumulation of toxic metals; bacterial overgrowth in the gut; and nutritional factors. A set of antibodies in the blood called rheumatoid factor (RF) will also lead to an attack on the body’s joint tissues. Arthritis in all its forms affects over 50 million people in the U.S., and osteoarthritis is the most common type. Osteoarthritis is more common in men before the age of 40, but between the ages of 40 and 70, women are more likely to get it. After 70, the rates are about equal. Osteoarthritis is thought to worsen from mineral deposits in the joints, food allergies, poor digestion, hormone imbalances, and a poor diet high in animal fat and other foods that promote an acidic environment in the body such as fried foods, oils, dairy products, sugar, gluten foods, caffeine, and alcohol. Too much acidity in the body will cause inflammation. Weight gain is also common in people with osteoarthritis due to lack of physical activity. As mentioned, rheumatoid arthritis is an autoimmune disease, in which the body’s white blood cells attack the cartilage in the joints, destroying the collagen structures, bones, and ligaments. As a result, fluid will accumulate in the joints, and lead to stiffness, pain, and swelling around them. Other autoimmune diseases also affect connective tissue, including lupus, scleroderma, mixed connective tissue disease, polymyalgia rheumatica, and ankylosing spondylitis. Osteoarthritis deteriorates the cartilage that protects the joints, causing bones to rub together and expose nerves, which leads to pain. Other examples of degenerative diseases include osteoporosis, macular degeneration, and multiple sclerosis. Although both arthritic conditions cause pain and stiffness in the joints, there are important differences between osteoarthritis and rheumatoid arthritis symptoms. For example, the joints in rheumatoid arthritis will be swollen, but in osteoarthritis there is usually little to no swelling. The following are other differences in rheumatoid arthritis and osteoarthritis symptoms. Time of Symptom Outbreak: Rheumatoid arthritis patients will often wake up with stiff joints in the morning, with symptoms lasting an hour or longer. Osteoarthritis patients will also wake up with stiffness, and it often goes away within a half hour, but will likely return after some type of physical activity. Location of Symptoms: Rheumatoid arthritis is symmetrical, meaning that the same joints are affected on both sides of the body. Osteoarthritis, on the other hand, is not. The degenerative condition tends to affect weight-bearing joints such as the hips, knees, and spine, but it can also affect the hands. Non-Joint Symptoms: Osteoarthritis will typically only affect the joints, but patients with rheumatoid arthritis will experience non-joint symptoms such as aching muscles, excessive fatigue, nerve damage, weight loss, depression, and dryness of the mouth and eyes. Children with rheumatoid arthritis may also develop a low-grade fever. Heat Symptoms: It is common for rheumatoid arthritis symptoms to include inflammation with heat and redness at the affected joint. Osteoarthritis symptoms include some joint swelling but without the heat. Lumps Under Skin: As rheumatoid arthritis progresses, the person may notice hard and tender lumps called rheumatoid nodules that are found under the skin and near the joints. In osteoarthritis, there may be lumps located in the joints; however, these lumps are bone spurs, which are excess bone growths found at the edges of the affected joints. Blood Tests to Diagnose Disease: There are no blood tests to diagnose osteoarthritis; however, since rheumatoid arthritis is an autoimmune disease, RF will be present in a blood test to help diagnose the arthritic condition. The table below displays a number of characteristics which explain the difference between rheumatoid arthritis and osteoarthritis. Prevalence of disease About 1.5 million people in the U.S. About 27 million people in the U.S.
What about rheumatoid arthritis vs. osteoarthritis in terms of a treatment? The goal for both osteoarthritis and rheumatoid arthritis is to decrease pain, minimize damage, and improve function of the joints. Non-steroidal anti-inflammatory and corticosteroid drugs are the conventional method used for both conditions, while immunosuppressive drugs can help stop the immune system from attacking the joints in rheumatoid arthritis patients. Supplements used for osteoarthritis include glucosamine sulfate, chondroitin sulfate, methylsulfonylmethane, S-Adenosylmethionine, vitamin K, boswellia, and devil’s claw. Rheumatoid arthritis supplements will include conjugated linoleic acids, manganese and superoxide dismutase, probiotics, bromelain, pancreatic enzymes, and hydrochloric acid. Other supplements for both conditions include curcumin, ginger, omega-3 fatty acids, vitamin C, vitamin D, and collagen. Murray, M., M.D., et al, The Encyclopedia of Natural Medicine (New York: Atria Paperback, 2012), 827–843, 932–947. Balch, J., et al., Prescription for Natural Cures: A Self-Care Guide for Treating Health Problems with Natural Remedies Including Diet, Nutrition, Supplements, and Other Holistic Methods (Hoboken: John Wiley & Sons, Inc., 2004), 50–57. Roth, E., “Is It RA? Rheumatoid Arthritis vs. Osteoarthritis,” Healthline web site, November 25, 2015; http://www.healthline.com/health/rheumatoid-arthritis/ra-vs-oa#Overview1, last accessed February 26, 2016. “Comparing Rheumatoid Arthritis and Osteoarthritis – Topic Overview,” Web MD web site, last updated September 9, 2014; http://www.webmd.com/rheumatoid-arthritis/tc/comparing-rheumatoid-arthritis-and-osteoarthritis-topic-overview, last accessed February 26, 2016. Altman, R.D., “Rheumatoid Arthritis (RA),” Merck Manual Professional Version web site, last updated August 2015; http://www.merckmanuals.com/professional/musculoskeletal-and-connective-tissue-disorders/joint-disorders/rheumatoid-arthritis-%28ra%29, last accessed February 26, 2016. Altman, R.D., “Osteoarthritis (OA),” Merck Manual Professional Version web site; last updated August 2015. http://www.merckmanuals.com/professional/musculoskeletal-and-connective-tissue-disorders/joint-disorders/osteoarthritis-%28oa%29, last accessed February 26, 2016. “Osteoarthritis (OA),” Centers for Disease Control and Prevention web site; last updated October 28, 2015; http://www.cdc.gov/arthritis/basics/osteoarthritis.htm, last accessed February 26, 2016. “Rheumatoid Arthritis (RA),” Centers for Disease Control and Prevention web site, last updated October 28, 2015; http://www.cdc.gov/arthritis/basics/rheumatoid.htm, last accessed February 26, 2016.